Castleton’s Nordic ski team poses proudly with their first place trophy. 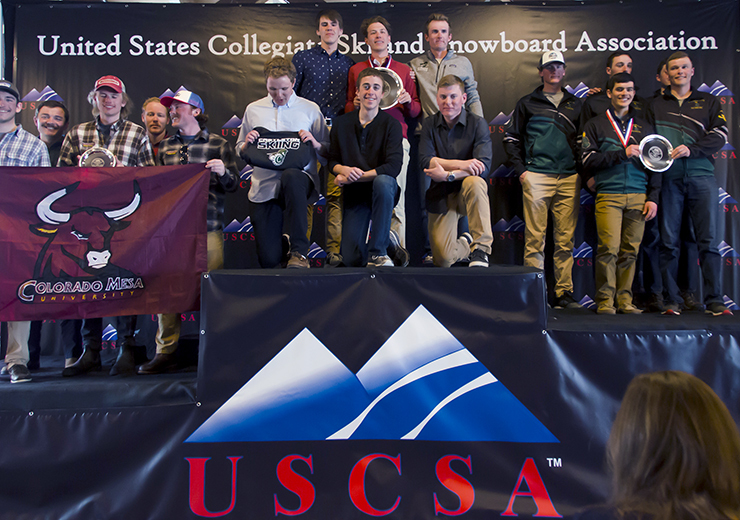 The Castleton men’s Nordic Ski team is on top of the country as they won the overall National Championships this past week in Jackson Hole, Wyoming at the Trail Creek Nordic Center. Both the men’s and women’s team closed out their best seasons in their fourth year as a varsity team. The men went undefeated, and the women finished top three in every race before placing fourth overall at Nationals. Freshman Andrew Doherty and sophomore John Henry Paluszek led the men’s team all season. At Nationals, Paluszek took second place overall including a first place finish in the sprint. Doherty finished just one spot behind him, placing third place overall, including second place finishes in the 15-kilometer freestyle and 7.5-kilometer classic races. Paluszek spoke on the team’s performance in Wyoming. Nordic Head Coach Marty Maher spoke highly of the two, who are both in their first year at Castleton. “We knew that both John and Andrew were talented skiers, and with that a good work ethic. That rubbed off on the whole team,” he said. In the end, the men’s Nordic team finished first in three of the four events. They won the 7.5-kilometer classic race, the sprints, and the 15-kilometer freestyle. In the team relay, the men finished in third place. Both Paluszek and Doherty earned four USCSA All-Americans, which is a top-10 finish, as David Harvey earned one with a 10th place finish in the 15-kilometer freestyle. The team finished with 74 total points, 17 points less than the next best team. Paluszek was happy with the team’s determination leading up to Nationals. “A lot of work was put into the season, and this week was very long and very hard. If you watch the videos, everyone is falling down at the finish line,” he said. As for the women, their fourth overall finish is their best in four years as a team. Senior Megan Greene put on a show, finishing sixth overall. She also earned four All-Americans, finishing top-10 in every event. In addition to their fourth place finish, Castleton was allowed to assemble a “B” team that could race as a separate group at Nationals. That team finished in fifth overall, just one spot behind the first team. In other words, two Castleton teams finished better than ten other first-teams in the nation. Maher called it “impressive.” The women’s Alpine and Nordic team also won the President’s Cup for best combined scores. Maher was proud of his team for their effort all season, as both teams continued to improve from the years before. As each team continues to get better and better, the potential is high for Castleton Nordic Skiing. Paluszek is excited for next year. “The team’s already motivated for next season and we’re ready to make more friends, have more fun, but hopefully bring home more titles,” he said.